The rule, square and line are the tools of a stone mason, from which the Masonic Lodges originate. 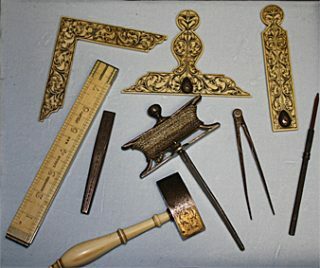 For masons, each of the tools is also a reminder of moral obligations of being a mason – the ruler for example is 24 inches long and represents a 24 hour day. This learning method dates back to the days when most stonemasons could not read, and symbolic aides meant more than words on a page.